Purpose: Quality of life (QoL) is a broad outcome that is often used to assess the impact of treatment and care interventions in mental health services. QoL, however, is known to be influenced by individual values and preferences. 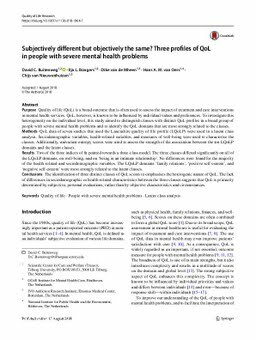 To investigate this heterogeneity on the individual level, this study aimed to distinguish classes with distinct QoL profiles in a broad group of people with severe mental health problems and to identify the QoL domains that are most strongly related to the classes. Methods: QoL data of seven studies that used the Lancashire quality of life profile (LQoLP) were used in a latent class analysis. Sociodemographic variables, health-related variables, and measures of well-being were used to characterise the classes. Additionally, univariate entropy scores were used to assess the strength of the association between the ten LQoLP domains and the latent classes. Results: Two of the three indices of fit pointed towards a three-class model. The three classes differed significantly on all of the LQoLP domains, on well-being, and on ‘being in an intimate relationship’. No differences were found for the majority of the health-related and sociodemographic variables. The LQoLP domains ‘family relations’, ‘positive self-esteem’, and ‘negative self-esteem’ were most strongly related to the latent classes. Conclusions: The identification of three distinct classes of QoL scores re-emphasises the heterogenic nature of QoL. The lack of differences in sociodemographic or health-related characteristics between the three classes suggests that QoL is primarily determined by subjective, personal evaluations, rather than by objective characteristics and circumstances.